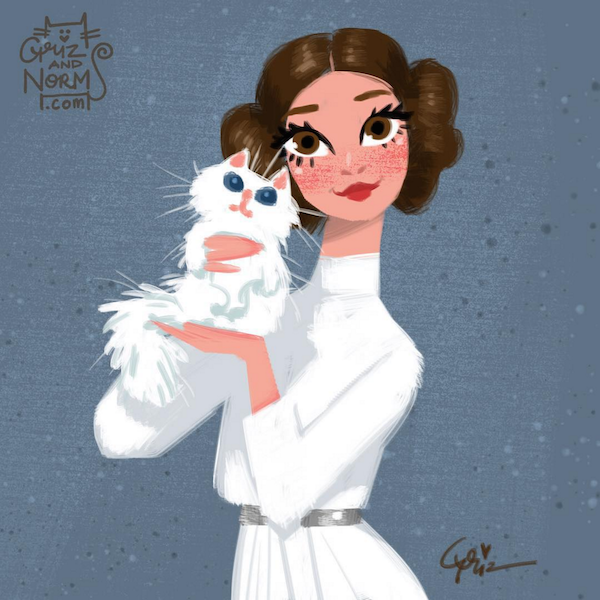 Disney feature animation artists Griz and Norm Lemay, previously featured for their gorgeous series pairing Disney characters with designer shoes, return with more of their stylistic illustrations. In celebration of Star Wars: The Force Awakens’ release, they have decided to pair some of their favorite Star Wars characters with fluffy cats that they might have. For example, Rey would possibly own a wild-looking Bengal cat, while the adorable BB-8 droid would have Calico kittens to match his orange-and-black color scheme. Do you think Star Wars would be even better with cats? Check out their illustrations below, and follow the duo here for more of their works.